There is a lot changing in the modern age of education. Technology, first and foremost, is the major game changer in all facets of life, but especially in the classroom. The way that teachers do their jobs and the way that students learn is transforming constantly. Technology is giving teachers the ability to engage students and differentiate their instruction in powerful ways. Not only this, but with technology teachers can track and monitor student learning like never before. This push toward big data has important implications in education. I believe the most significant change that big data will bring in education is a revamping of standardized testing. The standardized testing movement began as a way to bring accountability into schools and monitor their progress toward state and national standards. While a noble goal, many view standardized testing as a hindrance to genuine learning. Teachers feel bogged down teaching to the standards and students feel pressured to perform. The last two presidents have focused so much on standards and testing because of the United States’ scores on international tests. But who really believes that test scores are the end-all-be-all in determining a child’s learning? Instead of focusing so much on standardized testing, I hope to see technology usher in a new era of big data. Now, when I use the term “big data” I’m not referring to some impersonal classroom setting where students log onto computers and teachers are obsolete. Nor am I advocating that technology can solve all our educational woes. What I am saying is that technology can be used to rethink what education is and how schools function. Big data will allow teachers to track and monitor students not just at a few critical checkpoints throughout the year, but rather each and every day in the classroom. 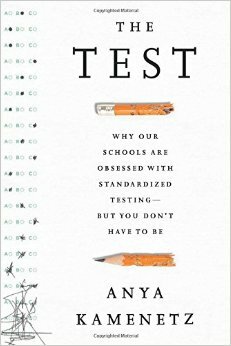 In her book “The Test” author Anya Kamenetz questions why schools are obsessed with standardized testing. In a recent article published for NPR, she offers some great alternatives to the testing craze. As a teacher, I would love to see schools adopt new accountability measures that focus more on whole child development as well as each child’s personal strengths and weaknesses, instead of a standardized blanket approach. With big data, schools can sample student results to track progress by looking at random checkpoints in different measures. Schools could also incorporate the use of other types of assessment, such as portfolio assessment, that can follow students throughout their education. My favorite feature, however, is the ability for teachers to keep track of a student’s progress toward mastering different standards. Anyone who has worked in education knows that students reach learning standards at vastly different paces throughout their education. It would be best to pass on information about each student’s strengths and weaknesses from year to year. This would mean greater transparency from between grade levels and between schools within a district so that teachers can spend more time on facilitating learning instead of diagnosing deficits. My school has technology throughout the entire building. Every student has a computer to use in class all day and at home at night. With such powerful technology, I want to see a movement transpire that could show all stakeholders in education the power of big data to enhance genuine learning. When parents, administrators, local leaders, and then policymakers see how technology can transform learning I think there will be a standardized testing revolution.